A few days ago, we received a wine that I didn't know and that I special ordered for a customer. Due to the fact that I pride myself as a professional and skilled wine buyer who know and tasted most of the wines in the store and beyond, I had to taste this wine. You see, tasting every wine that I buy for the store is important for me, but more especially for my customers. Moreover, I need to admit that I do have tremendous difficulties to sell a wine that I never tasted, because of lack of knowledge, passion and conviction. I can talk about the region, the grape(s), the vintage and give an approximate profile of how it should or will roughly taste, but I can't lie or invent something about a wine. Anyway, I'm a really bad liar and people will immediately realize that I'm full of it if I was lying to them (for anything). Thus, I rather not lie and taste the wine, which is much more fun and enjoyable and will allow me to be truthful about the wine (and suggest the right wines to my customers in the end). Moreover, it is important for the reputation of the store, but also for the consistency and the quality of the wines that we carefully and meticulously selected then bought to feature on the shelves. Customers rely on us to do a good job and we do not want to disappoint them. So, I brought this little Garnacha based Spanish wine at home to taste it with my wife and was pleasantly surprised. First, I need to say, the label is quite attractive: kind of pale, pastel turquoise-green-blue, modern style, simple and sober yet well designed and eye-catching. Bodega Bernabeleva is located in San Martín de Valdeiglesias, a little village lying about 72 kilometers (45 miles) west of Madrid, part of the "Vinos de Madrid" DO (Denominación de Origen). As one drives west from the capital city, the terrain quickly becomes rugged and mountainous, the air cooler, and one begins to see signs of an earlier era: houses and estates with older architecture in scarce remote villages, sculpted stones and rustic landscape where vines seem to be the only aspect of nature that has been tamed by men. Bodega Bernavelda's story started here, on the eastern edge of Spain’s Sierra de Gredos mountains, when a renowned Madrid doctor named Vincente Alvarez-Villamil purchased a piece of land in 1923. The site, which at that time was a full day’s travel from Madrid, spoke of its Celtic past, with ancient bears carved from boulders to mark forests dedicated to the hunt goddess. Hence the reason why Vicente named the estate "Bernabeleva" which means "the bear's forest". 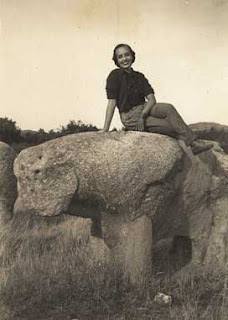 The logo representing a celtic woman carrying a glass on a bear's back was probably inspired by the ancient history of the area but also somewhat by the following picture of Vicente's daughter, Luisa, sitting atop of a stone carved bear. Despite its ancient history, Vicente believed that the land had great Terroir and was a special place to plant the noble Garnacha grape (Grenache), a place whose wines might exhibit profound character and exciting varietal character. Eager to exploit the potential of his land, he started to plant some Garnacha vines in 1926, but his dream was stop 10 years later with the Spanish civil war which devastated the country in 1936. He held on strong on his land and the vines for the next opportunity to fulfill his dream. The opportunity finally arrived in 2006 when two of Vincente’s great-grandchildren, Juan Diez Bulnes and Santiago Matallana Bulnes, vowed to fulfill their ancestor’s dream. The estate’s vineyards were now 80-years-old, and there were other Garnacha vineyards to purchase from neighboring properties as well. Rejecting current fashions in Spanish wine which favored heavily extracted fruit flavors and new oak barrels ageing, the cousins resolved to make wines of purity and expressiveness that were in harmony with the beauty of their ancestral land. Juan and Santiago’s ambitions were well supported by the terroir. The vineyards are more than a half mile above sea level, with warm days but cool nights, and vines planted on poor, sandy soils. The resulting wines have ample ripeness, but also astounding bouyancy and freshness. Just as important, they hired as full-time manager a young Catalan named Marc Isart Pinos. Marc’s devotion to demanding viticulture and to non-interventionist winemaking have served the cousins’ vision well. First, I need to say, the label is quite attractive and easy to spot on the shelf: kind of pale, pastel turquoise-green-blue, modern style, simple and sober yet well designed and eye-catching, with great texture and a distinctive logo (Bravo! to the person that came out with such an ingenious label, Marketing-wise, it is a fine example of simplicity and efficiency). 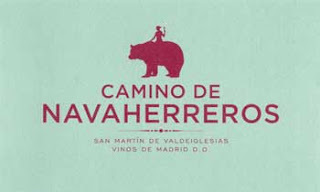 Camino de Navaherreros is one of 5 Garnacha based wines that they produce at Bodega Bernabeleva. It was fermented and raised in large neutral wood to avoid influencing and parting the varietal character and the Terroir oriented profile. The resulting wine is quite intense, explosive and fresh, especially for a wine with 15% of alcohol. In the glass, it has a clear, light and bright ruby color of medium to light intensity (definitely lighter and less dark than a lot of Garnacha that I've been tasting lately). The nose is fresh, clean and quite expressive with bright red and dark cherry with mineral, touch of spices and earth combined with floral notes. The clean, fresh palate is definitely brighter and higher in acidity than any Garnacha I've tasted lately (I know I'm repeating myself, but It was such a nice surprise). I usually love the intense, riper fruit and almost milk chocolate-like attitude of certain Garnacha, but I need to admit that "Camino de Navaherreros" is an intriguing and inviting, much more versatile Garnacha. The mid-palate expresses the difference in temperature between the hot days and the cool nights, combining nicely ripe red fruit with high acidity, mineral and spices in a juicy way. The lingering finish is quite smooth and crisp with present yet fairly integrated tannins. The overall profile of the 2008 Bernabeleva "Camino de Navaherreros" Old Vines Garnacha is nice, juicy, light to medium bodied, quite smooth yet racy, much more traditional and authentic of this uniqueTerroir, and far from other Garnacha from Navarra, Priorat and Montsant that are usually (in many cases) overly extracted and hugely oaked. I loved the fresh, earthy, somewhat rustic and old world oriented attitude of this wine. A must try in my opinion. Definitely not your everyday wine, but certainly food friendly. Step into the Green! Drink more Biodynamic and Organic wines ( and Food) from sustainable cultures and respect the environment!